Due to unforeseen circumstances, I am going to have to cancel the March 2012 Scanfest. The next Scanfest is due to be held on Sunday, April 29th, from 11:00 AM to 2:00 PM, PDT. 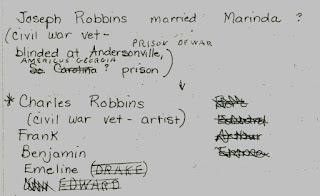 The earliest complete Robbins family that I have been able to research holds many tales of tragedy, woe, and dark secrets. This is the household of my 4th-great-grandparents, Joseph Josiah Robbins, and his wife, Marinda Robbins (yes, a Robbins married a Robbins...were they related? Perhaps...) who had seven children, five boys--three of whom were named a variation of Ben--and two daughters. Today I begin the tale of the two daughters, sisters whose lives were very different from each other, but who both lived lives of tragedy of one sort or another. I have no photographs of these women, nor do I have an idea if any have survived the passage of time. Records documenting their life have been difficult to come by and have taken years to collect. But they were women; living, breathing women who attained adulthood, who lived during a time when women had few rights and were not deemed important enough to have much written about them, unless they were extraordinary or notorious. And ordinary women these two were. One married, had children--burying two, and died young, while the other--mentally disabled--lived the last years of her life in an asylum. Both died and were buried far from family. 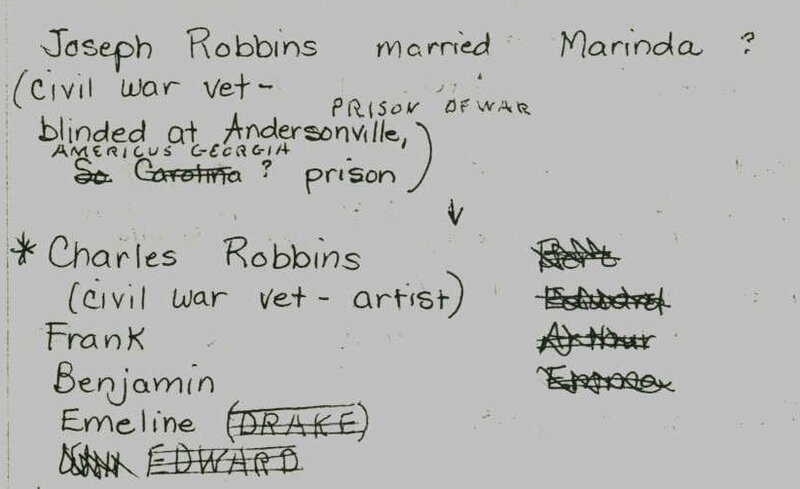 When I first learned about the Robbins family tree, I didn't even know about the existence of one. Charles H. Robbins (1844 - 1934) - my great-great-great-grandfather. It is Emeline and Evaline who will be my focus: two ordinary women who grew up in the same home, but whose lives followed diverse paths. The best way we can honor the past is to remember it, and these women are worth remembering if only for the fact that they were family members. Come along with me as we explore the journeys they took, in this, Women's History Month.